Sometimes, the most important thing for a music player is it’s size. You may not need a lot of output power or the ultimate sound quality. Do you want to build a kitchen radio, a radio clock or a music player for your kids? You want it to be small and inexpensive? Then have a look at the MiniAmp. While it is designed for the Raspberry Pi Zero and has the same size, you can also use it with the larger Raspberry Pi B+/2 or 3. 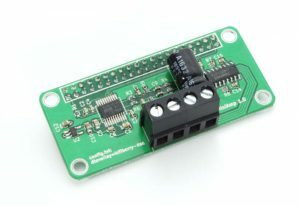 All Raspberry Pi boards with the 40 pin GPIO connector will work. The Amp will be directly powered from the Raspberry Pi power supply. It provides up to 2x3W output power. We’re interested to see what you will do with it.